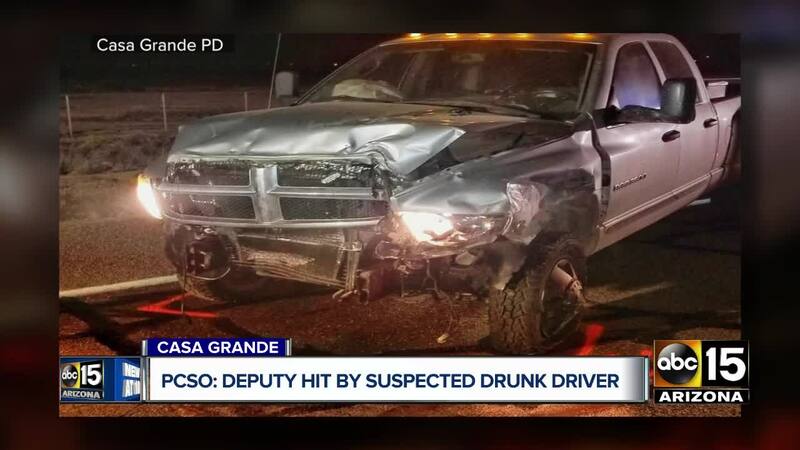 A Pinal County Sheriff's deputy is recovering in the hospital after being struck by a suspected drunk driver in Casa Grande early Saturday morning. Pinal County Sheriff's Office has released a mugshot of the suspected drunk driver who struck a sheriff's deputy early Saturday morning near the City of Casa Grande Airport. Officers say 32-year-old Bryan Whittemore, struck the deputy's vehicle from the rear, knocking the deputy, who was standing along the passenger side, back towards the airport fence. According to PCSO officials, the deputy was overseeing a traffic stop waiting for a tow truck to tow an impounded Chevy Blazer along the southbound lane of Pinal Avenue by the Casa Grande Airport around 1 a.m. The driver of the impounded vehicle had already been cited and left the scene. The deputy was airlifted to a Phoenix hospital with non-life threatening injuries and is expected to be ok, authorities said. Casa Grande police responded and closed the roadway for several hours while they investigated. Whittemore was arrested and is facing charges including DUI, aggravated assault, endangerment, aggravated criminal damage, and reckless driving.